Some pictures just make you go awww. Stephanie Okereke got married yesterday in Paris and her wedding pictures are now everywhere on the interwebs. The photos I think are really beautiful, with what is most important, a happy, smiling couple. The guests are also looking great, Bellanaija is reporting that there were about 400 of them, which included several Nollywood actors. I was reading somewhere whether small weddings were possible in Nigeria, where guest lists usually start from 200 and run up to thousands, or if one had to have a destination wedding in order to minimize the number of guests. But I wonder about destination weddings, don't they come with their own palava and expenses - travel, lodging, etc? I am thinking that if you keep the invitations low-key, and stay away from extended family and social groups, you might just work out a small wedding in Nigeria. My own church wedding/reception in Nigeria had at least 500 people in attendance and that was because we had split the guest list over two days. A similar number has attended the traditional wedding the previous day. Left to me, I would have had a small wedding, but our parents are the social types and it made us happy to honor them that way, especially as they supported us a lot in the planning as we were both outside the country. All the wedding activities went without a hitch and everyone was happy. That said, I can however see the appeal of exclusive, invites-only weddings, whether in Nigeria or at a destination outside the country - has anyone considered a Nigerian destination wedding - like Obudu, or Abuja if you both live in Lagos? With such a wedding, it is likely you know all the guests personally and you can cater with a specific number of people in mind, helping to keep expenses within your budget. So what about you ladies and gentlemen - if married, which one did you go for, and did it meet what you wanted? If you're not married yet, which do you prefer and why? 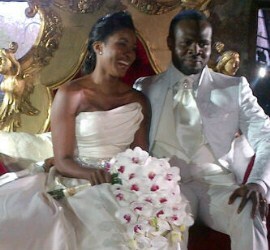 BTW, you can see more pictures of the Stephanie Okereke wedding here.